Ahmedabad/New Delhi:India’s next general election is almost three years away, but the race for prime ministership may have already begun. Narendra Modi, the controversial chief minister of Gujarat, started a three-day fast on Saturday—his 61st birthday—purportedly to bring peace, prosperity and harmony to a state he has ruled for nearly a decade. But the manner in which the fast has been played up as a national event reflects its larger political significance. Some other parties in the BJP-led National Democratic Alliance (NDA) also sent representatives. The fast, analysts say, is Modi’s springboard from which he is launching himself as the BJP’s, and possibly the NDA’s, prime ministerial candidate at a time when the ruling Congress party-led United Progressive Alliance (UPA) is battling a spate of corruption scandals and a leadership crisis. Using the fast as a launch vehicle has symbolic value: the UPA recently buckled under the pressure of an indefinite fast by activist Anna Hazare to bring crucial changes to a proposed corruption law. 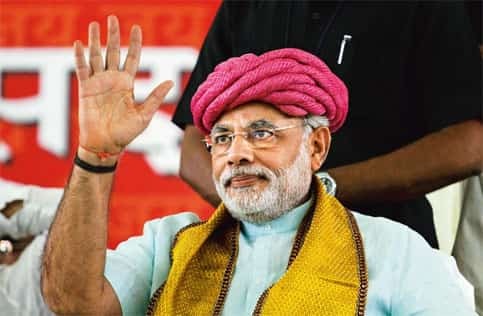 The stated purpose of the fast, bringing harmony to Gujarat, also deals with what many perceive to be Modi’s Achilles’ heel—his poor record in maintaining inter-community relations in the state. Within six months of Modi taking over as chief minister in October 2001, Gujarat faced its worst hour. More than 1,000 people were killed in months-long communal riots that started after the burning of a train carrying Hindu devotees at the Godhra station in February 2002. Many victims of the riots were Muslims, and critics accused the Modi government of not just failing to keep them safe but also of tacitly supporting Hindu rioters in an attempt to polarize the electorate and win state assembly elections due later that year. Whether the polarization was intentional or incidental, Modi then reaped its rewards. The BJP won by a handsome margin, and he became the poster boy of its hardliners, or the supporters of its right-wing Hindutva ideology. “Modi is a divisive, polarizing politician. He is a megalomaniac who revels in polarization. Essentially, he is not a democrat and does not believe in the basic democratic fundamentals of this country," said Jyotirmaya Sharma, professor of political science at the University of Hyderabad. “He has absolutely no brand of politics, whatever is referred to as his emergence is largely a consequence of the electronic media. People of Gujarat have so far bought the hype and propaganda he is selling, but now, that is diminishing," Sharma adds. Political opponents, too, find it easiest to target his divisive politics. “You cannot achieve sadbhavna (harmony) by merely going on such a five-star fast with the help of the entire state machinery. You first divided and polarized the society for political gains, and now talk about sadbhavna for political gains," said Congress leader Shankersinh Vaghela, who was himself with the BJP once. Even some allies of the BJP, such as the Janata Dal (United) with which it shares power in Bihar, have not been on good terms with Modi—fearful that this may cost them crucial Muslim votes. Ahead of assembly elections in Bihar last year, chief minister and Janata Dal (United) leader Nitish Kumar returned the ₹ 5 crore flood relief that Gujarat had provided his government two years earlier. 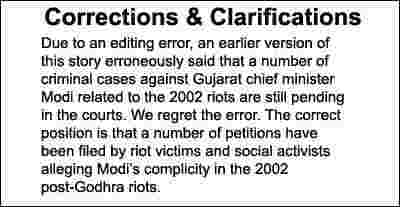 A number of petitions have been filed by riot victims and social activists alleging Modi’s complicity in the 2002 post-Godhra riots. Recently, the Supreme Court referred a case related to the death of Congress member of Parliament Ehsan Jafri during the riots to a trial court in Gujarat. This served as the cue for Modi to launch his fast. He said the apex court order vindicated his stand that he never supported the rioters, and promptly announced his fast for harmony. While faltering on the social harmony front, Modi has keenly cultivated the image of an efficient and pro-business administrator. Gujarat’s gross domestic product has been growing at 11%, higher than the national average of 8-9%, and it has attracted thousands of crores of rupees in investment, mostly through the showpiece Vibrant Gujarat summit, a biennial congregation of industrialists from around the world launched by Modi. The state has signed memorandums of understanding worth more than ₹ 40 trillion since 2003. More companies have firmed up investments in Gujarat than in most other states of the country. The state is on its way to become an auto hub, with Tata Motors, Ford, Peugeot and Maruti Suzuki eyeing investments. Many important projects started before Modi was sworn in as chief minister have also materialized in his tenure. The project to build a dam on the Narmada river is an example. The state government’s rural electrification mission lit up even remote parts of Gujarat. With an aim to promote clean energy, Gujarat hopes to produce 200-300 megawatts of solar power by the year-end, making it the solar capital of the country. “You are foolish if you are not in Gujarat," Ratan Tata, chairman of Tata group, once said. Industrialists Anil Ambani and Sunil Bharti Mittal said he was a prime ministerial candidate ahead of the 2009 general elections. International recognition has also been forthcoming. In December 2008, members of the lower house of the British parliament passed a motion to support Vibrant Gujarat. The US declined him a visa on account of the 2002 riots. But recently, a US Congressional Research Service report lauded his governance abilities and said Gujarat was perhaps India’s best example of “effective governance and impressive development". G.V.L. Narasimha Rao, member of the BJP’s electoral reforms committee, said focusing on economic development was not a deliberate strategy to erase the stain of the 2002 riots. “It is wrong to say he changed his brand of politics after 2002. He always knew this was what he wanted, ever since 1996. He always wanted to make development and good governance his plank. He is a man with firm convictions and has a very strong mass base," said Rao, who has known Modi closely for more than a decade. His rise through the ranks was brisk. Modi was made general secretary of the Gujarat unit within a year. Zealously building the party in the state, he aimed at creating a strong mass cadre and assumed the role of a strategist. 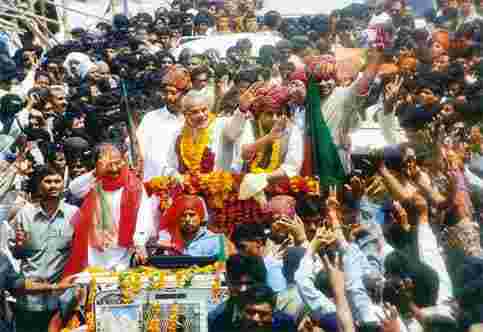 In 2001, he got his big break when he was chosen by the party to replace Keshubhai Patel as Gujarat chief minister. His proximity to senior party leaders and his contribution to building the party’s base in the state were the key factors behind his choice. Although Modi was victorious the 2002 assembly elections because of communal polarization, the election five years later was fought, and won, on the plank of good governance and development. Now, with the fast for harmony, he is hoping to move a step further. Modi’s clout in the state cannot be ignored. Be it his effort to bring in industries to the state, his oratory skills or his dressing style, Modi has managed to catch the imagination of the masses, while building a huge popularity among women. Voters, including women, have turned up in significant numbers in both assembly elections that Modi won. Voter turnout in the 2002 state assembly election was a healthy 62% and the turnout of women voters was 58%. The corresponding figures for the 2007 assembly election were 60% and 57%. Contrast this with the voter turnout in the 2009 Lok Sabha polls, which was 58.13% while the turnout for women was just 48%. “Modi’s efforts to empower women especially his girl child education campaign has been a huge success. Also, there is a provision in the state wherein if you register property in a woman’s name, you get some rebate. Overall, if you see, females in Gujarat are a lot more secure than elsewhere. A girl can move around even late in the evening with no worries, thanks to Modiji’s good governance," said Rajeeka Kacheri, convenor for state BJP’s information technology cell. Modi is perceived to have many rivals within the party. Few of them can however claim to have as large a mass following as him. Public spat among some of these leaders, particularly after the BJP lost the 2009 general elections, have also helped Modi step ahead. A senior state government official, who asked not to be identified, said the death of BJP leader Pramod Mahajan, who took care of the party funds, in 2006, “led to a vacuum in the party which has been filled by Modi to a large extent." Senior BJP leaders L.K. Advani and Arun Jaitley, leader of the opposition in the Rajya Sabha, attended the launch of Modi’s fast on Saturday. Recently, the entire party rallied behind him during his public battle against Gujarat governor Kamla Beniwal, whom he accused of bypassing the state government while appointing retired justice R.A. Mehta as lokayukta (ombudsman). “It is said that while Modi is close to L.K. Advani and Arun Jaitley, Sushma Swaraj and Rajnath Singh are not friendly with him. However, even they came out to defend and endorse him after the Supreme Court order (in the Jafri case), which is an indication of his growing acceptance even within the party," said a BJP leader in Delhi, seeking anonymity. Another senior party member, who also requesting anonymity, said that “while there was an attempt to pitch him as the prime ministerial candidate in the 2009 Lok Sabha elections, he, however, wasn’t ready then." He seems much better prepared now. Activist Teesta Setalvad, who has filed cases against Modi on behalf of riot victims, said his “clean image" is nothing but “jargon". While accepting that Gujarat has recorded high growth in the last 10 years and the chief minister may take some credit for it, Setalvad said Modi’s development formula is benefiting only 5-7% Gujaratis. “If only the Adanis, Ambanis and Tatas are benefiting, what about the vast majority of others?" She also accused the chief minister of using public money “to clear his riot-tainted image" by hiring APCO Worldwide, a US-based lobbyist firm. “Modi has done a good PR (public relations) job. APCO is being paid $25,000 per month by the Gujarat government," Setalvad said. Dancer and social activist Mallika Sarabhai agreed. “Modi is projecting himself as a CEO (chief executive officer) of the state. If you have a prime minister who is a CEO of the country who works only for the benefits of industrialists, what will happen to the rest of India? It would be a disaster," said Sarabhai, who once filed a public interest litigation claiming the state administration and Modi were “complicit" in the 2002 riots. Modi faces other political challenges before the 2014 general elections—the next state assembly elections, for instance, due next year. The party has set a target of bagging 151 out of 182 seats, surpassing Madhavsinh Solanki’s record of 149 seats in 1985. Rao said Modi has always been focused and ambitious “He is a man with a great eye for detail and he does not gloss over anything. He knew exactly how to progress and the political career he wanted to pursue." •Played an active role during his stint with the RSS, including in a 1974 anti-corruption agitation, and agitations during the 19-month-long emergency declared by then prime minister Indira Gandhi. •Held several posts in the BJP before he was made chief minister. In 1995, he was appointed the national secretary of the party and given the charge of five major states in India and was promoted as the general secretary (organization) in 1998. Modi is one of the most active politicians on Twitter with 336,709 followers, nearly double that of the leader of the opposition in the Lok Sabha Sushma Swaraj.